It started with a single rose for his mom. Tony Chisom had never been one to draw, but he found himself with a lot of free time on his hands. So inspired by a friend, he drew that first flower in 1988. 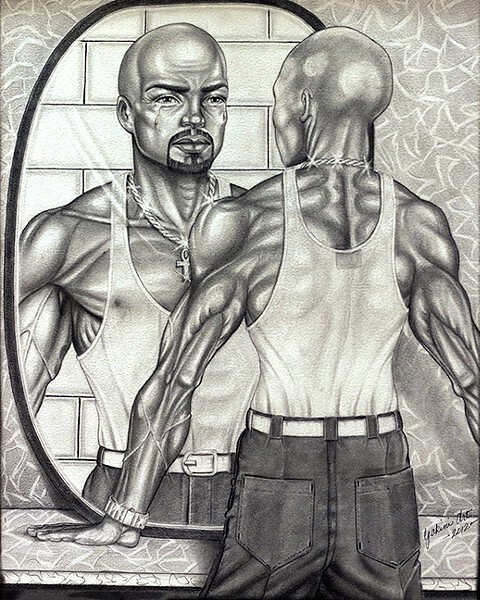 SELF-REFLECTION: The pencil drawing, 'The Man in the Mirror,' by incarcerated artist Tony Chisom is accompanied by a letter of apology that Chisom wrote to himself for the actions that led to his imprisonment. Those words, part of a longer piece titled I Apologize [Letter to Myself], hang at Cal Poly’s Robert E. Kennedy Library next to Chisom’s pencil drawing The Man in the Mirror—a young man in a white tank top with a crucifix necklace contemplating his reflection. 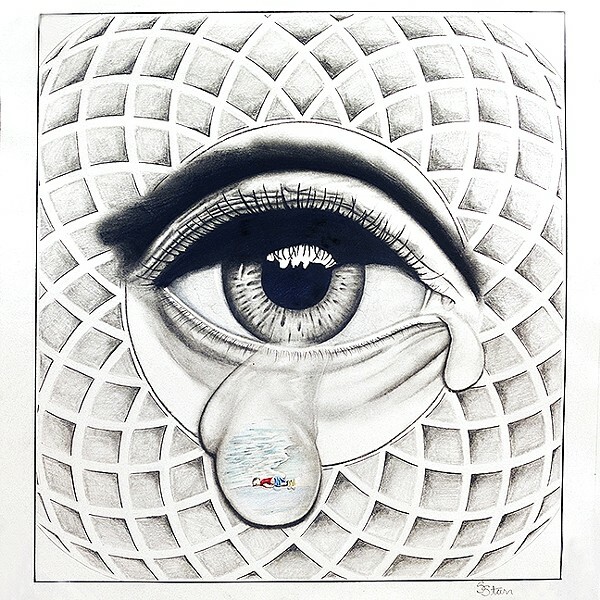 Chisom’s art, along with the work of other incarcerated artists from the California Men’s Colony (CMC) in San Luis Obispo, is part of the Between the Bars exhibit currently on display. Cal Poly sociology professor Unique Shaw-Smith worked with senior project students and artists from the CMC to bring the exhibit to fruition. Just like any other art show, these artists were required to submit an application and selected works for consideration. EMPATHY: 'Alan Kurdi' is a piece by incarcerated artist Steve Starr, inspired by an article about a 3-year-old and his family trying to escape the Syrian civil war by raft. The child’s dead body was photographed washed up on an island. The pieces in Between the Bars run the gamut of self-portraits, serene landscapes, models of cars, satirical political pieces, and more. One drawing, Alan Kurdi, by Steve Starr, features an eye with a tear falling out of it. In that tear is a drawing of dead Syrian child Alan Kurdi, whom the artist read about. The 3-year-old and his family were trying to escape the civil war in Syria by raft. Knowing that art supplies in prisons are often limited or close to non-existent makes these works of art all the more impressive. Shaw-Smith said the idea was for the art to change the perspectives of the artists and viewers alike. While Cal Poly once got much of its furniture made by CMC inmates, Shaw-Smith said many people are unaware of this connection and don’t stop to think about the men imprisoned there outside of the events that led to their incarceration. 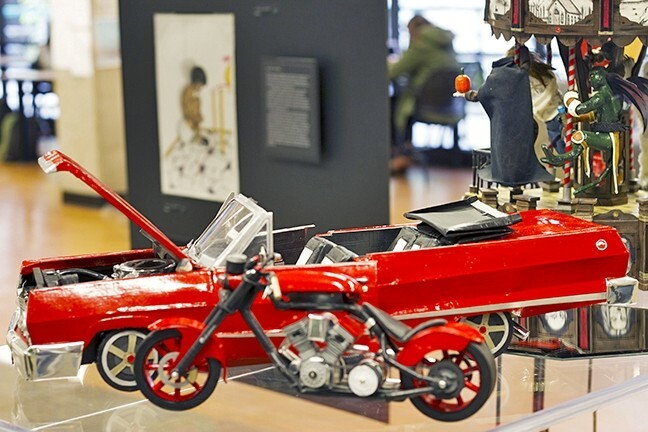 LIFELIKE: This model of a convertible car, Cruisin’, by incarcerated artist Cuong Tran is functional with doors and a hood that open. Patrick Moloney, senior librarian at the CMC, worked with Shaw-Smith to bring about the exhibit. He said this show, with art from inmates being displayed in the community, is the first of its kind for the CMC. Moloney said the feedback on the exhibit has had a tremendous effect on the artists. “That’s just re-instated that they have self-worth, and they need to focus on that,” Moloney said. Shaw-Smith said she hopes the exhibit, which could be displayed at Cuesta College after its run at Cal Poly ends, will make viewers rethink preconceived notions they may have about prison and the people who end up there. ART ON THE INSIDE: The Between the Bars exhibit will be on display on the second floor of the Robert E. Kennedy Library on the Cal Poly campus through June 9. Visit lib.calpoly.edu for more information. A roundtable talk with project collaborators will be held May 17 from 11 a.m. to noon in room 111H of the library. Send stories of shared humanity to Ryah Cooley at rcooley@newtimesslo.com.